If it had looked anything like in the project’s blueprint, the ducks and cattle would be replaced by 15-story apartment buildings, a series of low-rise buildings, supermarkets, swimming pools, and parks. Me Linh District was touted as an “ideal living space” with urban areas, gardens and mansions to reduce the capital’s population density, sending land prices soaring in the area. On La Thanh Road, the National Children’s Hospital lies 100 meters from the Hanoi Obstetrics and Gynecology Hospital. Traffic could be blocked any time since all it takes is one taxi driving slowly looking for a fare. The air is filled with the sounds of sirens, of patients’ vehicles constantly coming in and out, of security guards at the hospital’s gate and on the street urging vehicles to move faster with their megaphones. While Hanoi’s boundary might have expanded, the implementation of plans for the capital to develop westward has not gone as expected. The government failed completely as it could not move its offices to their new locations as envisaged in the plans. Thirteen universities were supposed to have moved out of the inner area. But except for the National University’s School of Law, which has relocated to Hoa Lac, the other universities are still there. The city transport department is looking into trialing a motorbike ban on Nguyen Trai Street or Le Van Luong Street. 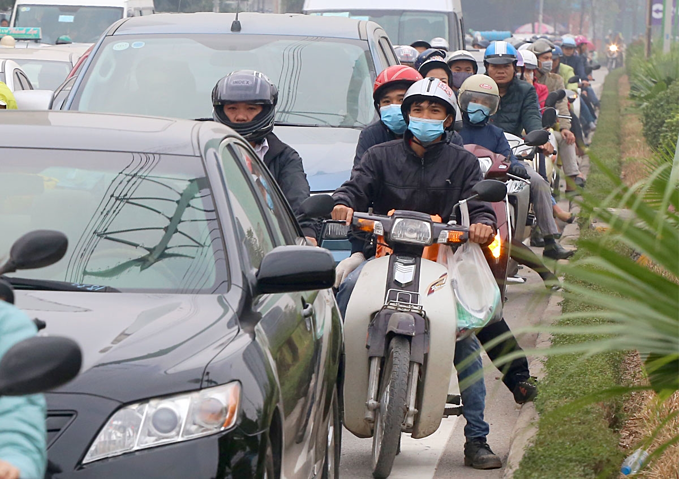 Two years ago, with over 91 percent of lawmakers approving, the city People’s Council also passed a resolution on the management of private vehicles with the aim of banning motorbikes in the city by 2030.